We love pesto made of herbs: fresh herbs, which are full of healthy stuff and at the same time a great quick meal – no matter if you prepare the pesto a la minute or have it already made and take it out of the fridge. Boil water, add pasta. At the table everyone is allowed to serve themselves the amount of pasta, pesto and cheese they prefer. This dish does fill you well and gives enough power for the rest of the day – be it for whatever work has to be done or to finish homework and get prepared for the next day at school – perfect family meal. In spring we love to have wild garlic pesto, in summer we prepare basil pesto and during the year we serve pesto with parsley, in between we stir up chives to make a yummy green pesto, or use olives, dried tomatoes, chilli and many other ingredients which can be cut up or grounded. 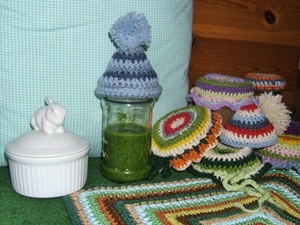 If you want to decorate your pesto jar prettily, find inspirations here. 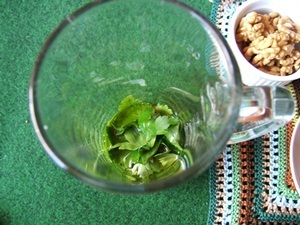 Start with pulling the parsley leaves from the parsley stems, put it in a high dish, or as we mix it in a stable beer mug, add some oil and nuts and blend. Add oil pit by pit until you have a creamy texture. Season with lemon juice and salt to taste. 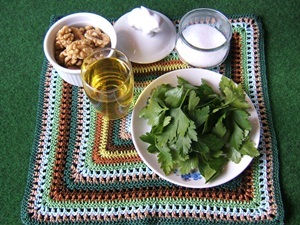 Those who prefer their nuts crunchier can add them when finished and blend only or lit, or chop them with a knife and add to the finished pesto. You can later use the chopped stems and add them to soup or stew. Those who have read other MiaDeRoca recipes and have tasted them know that we love garlic and like to use it in out kitchen. 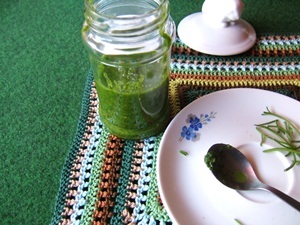 This pesto recipe is without garlic, on the one side parsley is a strong medicinal herb and is also referred to as natural antibiotic, on the other side the taste of parsley should not be covered by other ingredients, but supported. When cooking we like to use regional products – when making this parsley pesto you can do this too. Many different edible oils are produced in Austria like oil made out of sunflower seeds, corn and walnut oils, but rarer ones as well like oil out of flax and hemp seeds. As you only need a small amount of oil and you don't heat it, take one of the hight-quality oils from the higher price ranges. There are may walnut trees growing in Austria and we are lucky to know some walnut tree owners where we can go and pick walnuts in autumn. The grounded cheese can of course be Parmigiano or Pecorino, but you can use local aged hard cheese as well. You can serve this parsley pesto to spaghetti. With home made pesto you have also a quick meal at hand. You can always vary the base to your parsely pesto and use it on fried or grilled courgette, in winter have it on sunchoke or other storable vegetables like turnip-rooted chervil. When preparing the recipe I used this amount three times, which made up for 160ml. I put a lid on the parsley pesto and stored it in the fridge – in the MiaDeRoca fridge. By the time I wanted to do the pasta-shooting I saw that the pesto has vanished from the jar. I was told that it was spread on freshly baked bread – you can see this parsley pesto can be used as vegan spread as well. Maybe the parsley pesto was the reason how the whole team did get through the last wave of flu without any harm. Perhaps I will be able to add a new nice picture of a parsley pesto dish during the next week, if there ain't none you know that our team is vitamin empowered. Decorate your pesto glas with the matching parsley pesto labels - use this printable. Are you looking for a special recipe? 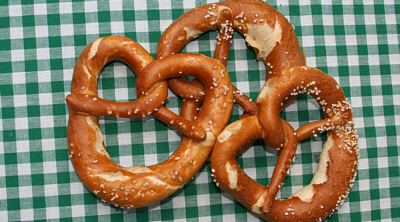 You have had a great dish on your last summer trip to Salzburg, or the dessert on your skiing vacations in Stubai was delicious or the cake you had for tea in Bozen is unforgettable and you would love to cook, bake, make that yourself? Write us an e-mail or leave a commentary! We love to prepare regional dishes and are always searching for new delicacies and titbits. If you like Pesto as well, tell us which is your preferred one or if you wish to have a certain pesto recipe we could provide.